Harsh reality comes alive as Marie is needed by her family to help support them, and she eventually follows in the footsteps of her older sister, accepting a modeling job with Edgar Degas. 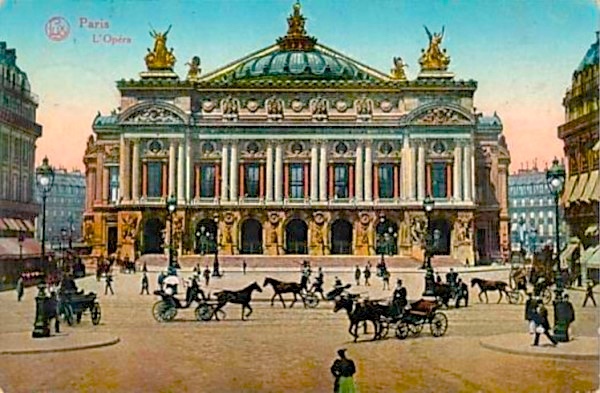 Working as an artist’s model earns her three times as much for four or five hours of work as she earns in a day at the Paris Opera, and working both jobs is tiring but financially ideal. Again, reality enters, and Marie is dismissed from the ballet for missing too many rehearsals. For at least a year, however, while Degas is working on the sculpture for which she is posing, she has better income and her family is better off. When Degas finally exhibits “Little Dancer” in 1881, it is a shock to viewers and critics. First, it is in wax, the medium normally used for first experiments and not for “finished” work. Secondly, the dancer’s clothing is real, as are her ballet slippers. And the public is astonished at her appearance: “Does there truly exist an artist’s model this horrid, this repulsive?” one critic asks. Another wonders, “Can art descend any lower?” A third refers to Marie as “a flower of the gutter.” After this showing, Degas never shows this sculpture again, and he never has it cast. The existing copies we have all seen in museums were not made until after his death in 1917, thirty-six years later. 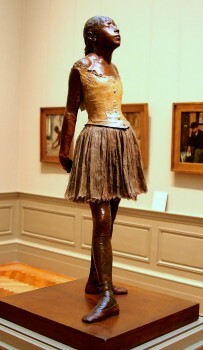 Among the most fascinating aspects of the author’s depiction of Degas himself are the sociological and philosophical influences which affected him and his work, and some of this may explain why the critics and viewers were almost universally negative about the depiction of the Little Dancer in 1881. Those who have read The Hare with Amber Eyes by Edmund de Waal, which features insights into the Impressionists and “border-line” Impressionists like Degas, are already familiar with the rampant anti-Semitism of the Parisian art world in the 1880’s, and some may recall that Degas was depicted in that book as the most virulent anti-Semite of them all. 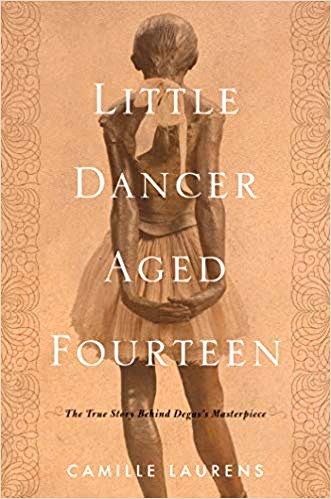 In Little Dancer, Aged Fourteen, Degas also reveals himself to be intolerant, even hateful, of other groups who are not part his own inner circle. Though he is realistic in showing that the Little Dancer leads an exhausting and painful life, he also uses this sculpture to illustrate his own belief in phrenology, which pervaded Parisian social life at that time, and his depiction of his dancer’s face and head may be harsher than they actually looked in real life. Her sloping forehead, prominent cheekbones, and thick hair give her “a criminal look,” as do her “Aztec features,” according to the tenets of phrenology. The author points out that in the preparatory drawings for this sculpture, Degas actually “changed her face to give it the hallmarks of a savage, quasi-Neanderthal primitivism, a precocious degeneracy. He literally altered her nature.” Ultimately, author Laurens admits that “it is hard not to loathe this forty-something conformist who in modeling his wax manipulated a very young girl for reasons that have nothing to do with art or aesthetics.” Several critics in the 1880s tried to justify Degas’s behavior in this area, claiming that he was trying to surprise viewers and make them think of how beauty can evolve from ugliness, opening the viewer’s mind to new ideas. Most viewers, however, were offended by the fact that the sculpture, presented inside a glass case, “on satin cloth as though it were an ethnographic curiosity,” was nothing more than “a doll, a common wax doll.” Ultimately, it becomes clear that no one knew then how to interpret this sculpture as sculpture, and I am not sure, after reading this fascinating book, how many readers in the present will separate Degas’s difficult, often mean-spirited personality from his sculpture, its background, and the controversies it engenders even within this book. Does it really matter to the aesthetics of the work that the Little Dancer’s physiognomy is not “accurate”? Or that the sculptor was illustrating an irrelevant phrenological agenda? Or, less likely, that he may have been trying to wake up Parisians to their false assumptions about the poor, the foreign, and uneducated? Sacha Guitry, an actor, playwright, film maker, and friend of many artists of the day, filmed Edgar Degas walking down the street in 1915. Degas was nearly blind and is using a cane as he walks with a woman friend. 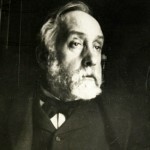 He is visible at the 14 second mark, and these 14 seconds are the only film ever recorded of Edgar Degas.